– Dara Sayaphouthone, Accounting Manager, Bodypoint, Inc.
Bodypoint, Inc. is a classic American success story. Founded in 1991, the company develops and manufactures well-crafted, highly functional products for people using wheelchairs. 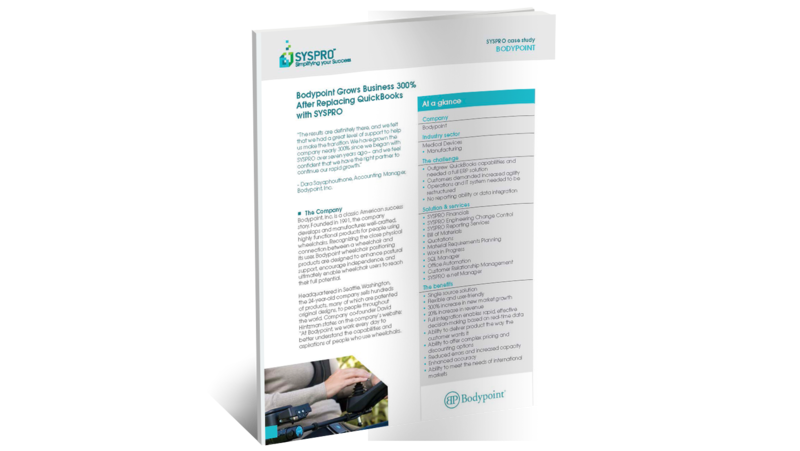 Recognizing the close physical connection between a wheelchair and its user, Bodypoint wheelchair positioning products are designed to enhance postural support, encourage independence, and ultimately enable wheelchair users to reach their full potential. Headquartered in Seattle, Washington, the 24-year-old company sells hundreds of products, many of which are patented original designs, to people throughout the world. Company co-founder David Hintzman states on the company’s website: “At Bodypoint, we work every day to better understand the capabilities and aspirations of people who use wheelchairs. Data integration/reporting issues – a database asset system that could manage inventory control and order entry, but that didn’t fully integrate with accounting. This required duplicate manual entries. Scaling/growth issues – As the company’s inventory and user community grew, its operations became more resourceintensive. The QuickBooks shortfalls did not support a strategy for implementing new processes that would yield greater productivity from Bodypoint workers. Reporting issues – the general lack of IT system integration/collaboration limited the ability of Bodypoint management to keep track of changing operational needs and opportunities. The lack of synergy made it almost impossible to identify areas that required immediate action or attention. Bodypoint knew it had outgrown QuickBooks and hired a consultant to help with the search to find a more robust back office technology solution. Over a six-month period, the company reviewed several ERP solutions available to the mid-market manufacturing and distributions market, and ultimately selected SYSPRO. The SYSPRO software implementation integrated all Bodypoint departments – including sales, accounting, manufacturing, purchasing, inventory and shipping – under one IT umbrella. With all company departments fully integrated, company management had the ability to make rapid, effective decisions utilizing real-time data. Today, using SYSPRO, Bodypoint has implemented new efficiencies that have made a substantial and financially measurable impact to its operations. Specifically, over a seven-year period Bodypoint estimates almost $400,000 in bottom-line operational savings via a substantial reduction in manual entry programs tied to both accounting and shipping. The company also identified other additional operational improvements that have favorably impacted its top and bottom lines of financial performance. Financial Reconciliation – Automated reconciliation between bank statements and internal financials, which has been reduced to a 15-minute ‘quick review’ operation. Data collection capabilities – “Using SYSPRO, we can easily see and compare anything from our operations, activities, etc., for any time period,” Sayaphouthone says.